This page outlines basic skills in the subject of History. In the United Kingdom educational system, the skills demonstrated here are essential to pass the w:GCSE level 2 qualification and are then used for a foundation on W:GCE Advanced level History, a level 3 qualification. Analysing a source is one of the key basic skills in History. When referring to a "source" in itself, we mean a source of information, meaning obviously that it is something that gives information, regardless of what that information actually is. Now this can be anything, from a historical quote, to someone stating their experiences, to a radio broadcast, a newspaper, a book, or anything of the sort. Of course as stated, these things all have one thing in common, providing information. However, this does not mean every source should be judged with the same value, as there are different factors that determine the worth of various sources to historians. Sources of information come in different types, this is something that helps historians establish their historical worth. Primary Source- A primary source of information (also called original source), is a source which comes directly from the subject it is related to. To expand on this further, primary sources are "first hand sources", meaning they created from the direct knowledge of an event, situation or person. Meaning a primary source is a direct interpretation and analysis of something and stems from no other work. 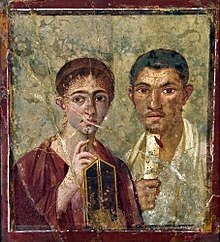 This wall painting found in the Roman city of Pompeii is an example of a primary source. An example of a primary source, would be a witness account from someone who experienced a major event. A) Not the full picture- There is a chance that the information which primary sources provide, do not give the full picture and viewpoint on a particular event. Mostly because they are "one place, one time" sources and because they are created at the time of the event. Meaning they cannot analyse the consequences/effects of the particular subject, hence the individual viewpoint they give on the is going to significantly differ and as a result reflect the values of the time rather than give a full historical picture. "You imagine the New York of today, with people everywhere you go asking for money, well it was ten times worse than that,"
The source outlines that New York was poor in the great depression, this is possibly correct, but in relation to point A. We can see being a primary source that it tells us only what happened from the eyes of the man who experienced it here, as a result it does not explain what caused it to happen, or any other perspective on it other than his own. B) Opinion- Primary sources are more subject to the persons opinion being reflected in the context. This is because with witness accounts, they are usually only going to see their own view on what happened rather than see that of another, which relating back to point A can give an unclear picture. To explain this, we use the background of the sources to evaluate their bias. For example, if we were to evaluate sources on the kristallnacht, one from a jewish victim another from a nazi soldier. You will see that the Jewish victims account would describe the event to be far more dramatic, awful and disastrous, on the basis that they were the victim and would inveitably would present it as such. Whilst the Nazi soldier's account would likely be giving a more righteous field to his account, seeing it as more justified and as a result minimizing his description of how severe the event was. This page was last edited on 6 September 2010, at 12:28.